Yes, my child had lice! Here’s what I learned. Nits, the eggs, take seven to 11 days to mature and hatch. Lice are genetically programmed to look for new heads or hosts all the time. During their 30-day lifespan, the female louse lays between 5 and 10 nits each day, so the issue can easily escalate to hundreds, and even thousands. Lice can be hard to spot. I really had been checking my daughter’s hair for nearly a week, but only when it was dry. I have since learned, it is much easier to spot when the hair is wet (apparently it slows them down) and combed with a fine-tooth comb. If you see letters coming home from the school regarding a breakout, make this part of your routine every time your child washes their hair. The treatment from the pharmacy is not a one-time-fix-all. I went to the pharmacy as soon as we realized what was going on and bought an over-the-counter treatment. Reading the instructions carefully I learned it only kills the bugs already hatched, not all those tiny eggs they’ve laid on your child’s hair. The treatment I used suggested two treatments seven days apart (we’ll talk natural treatments below) On every day in between, I removed more eggs and lice by carefully wet combing her hair with a lice comb (this is the one I used). It’s gross, and time-consuming, but necessary. I still found more on day seven, treated again, and wet combed every day for another week until the problem was gone. You need to comb and pick, and comb and pick. I know. I already said that. But it’s the only real way to really get rid of the eggs. It can be a difficult process if your child, like mine, thinks combing her hair is a method of torture. I got past that with bribes, I won’t lie. Also, I combed with conditioner in her hair which made it an easier process. Treatment means dealing with more than your child’s head. You are going to want to throw all their hats, sheets, clothes etc. into the wash. If there are items in their bed that you don’t want to launder, bag ‘em up for a few days; lice can’t survive beyond 48 hours without a supply of fresh blood. (We bagged up all stuffies that weren’t needed and washed everything else with hot water every time we found nits or lice on her head) Don’t forget to sterilize brushes and combs as well! An ounce of prevention is worth a pound of cure. There are a lot of products out there that hold the promise of lice prevention. I can’t say whether they work or not. Obviously, you can ask your child not to share hats with friends or avoid head-to-head contact. A few things that have been said to help: tying your child’s hair up in braids if it is long, adding certain essential oils in their shampoo. Once a week, take a peek. I found that line on the Lice Squad website and I love it. It’s true, the best way to avoid a bigger issue is to do a proper check once a week to try and catch them early! Don’t forget to clean the comb. Licefree.com suggests either wiping the comb on paper towel, soaking it in hot water (my preference) or running it through a cycle of your dishwasher. The smother technique. My friend says she coated her daughter’s hair and scalp in olive oil. I swear she told me she left it on overnight, which sounds messy to me. Healthline.com explains how to do it, and says some experts say this doesn’t kill the lice, but merely slows them making them easier to get with the comb (which is again, the key to getting rid of the bugs). The essential oil route. The HeadLice Center says lavender oil can help treat and repel lice. The site suggests mixing lavender oil with a carrier oil, such as coconut, and applying it to the hair and scalp. I did this for my two-year-old son, complete with shower cap cover since you have to leave it on for a while. But I also did the methodical combing of his hair to ensure there were no lice or nits. Once you get rid of the lice you can add lavender oil to your shampoo to repel the bugs. Other parents suggest Tea Tree works the same way, and swear by adding a few drops to their shampoo. Comb. Comb. Comb. Every treatment option I have ready about has stressed the fact that the only way to ensure you get both the lice and the nits is through combing. Invest in a good comb you can sterilize easily (the one that came with the treatment I bought melted in hot water) and have patience. Here is the comb recommended by a number of PPPS parents: the terminator comb. Another mom recommends the Robicomb. I bought this set with a few different options. IT’S NOT WORKING! WHAT DO I DO? If you find your treatment isn’t working you can turn to the specialists for help. I used Lice Squad for five of us. Four girls heads with thick, longish hair, plus one boy equaled a nightmare for me. 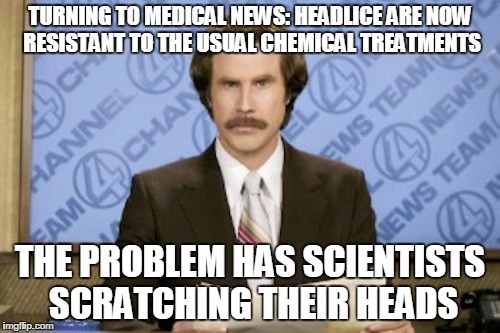 Of course, I couldn’t check myself and my husband who has a buzz cut (so he didn’t have to worry about checking his hair) wouldn’t go near lice-infested hair so he was useless. Hence, I decided to go to Lice Squad and they did 5 of us all at once. 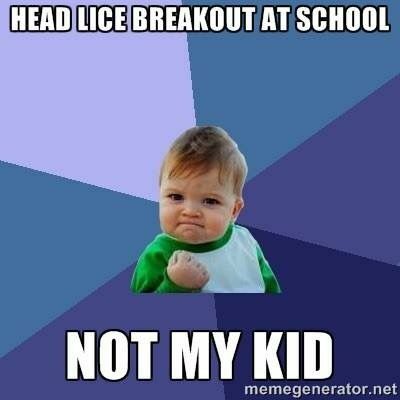 Thankfully, I was lice free (I guess my kids don’t hug me enough) but the rest had them. Some only had 2 eggs whereas one daughter had 800 – I guess she was ground zero and one of her besties had it the week before I later found out so that’s how it was transmitted at school. I won’t lie, Lice Squad is extremely expensive when you have five people getting treatments but the stuff they use is guaranteed and they spent hours combing through our hair putting every single egg, nit, and louse on a paper towel and counting them. Now that’s service! You also have to go back for a secondary check as part of their service and they do it all over again to make sure the head is clear.